I would like to present to you the unofficial Vegan & Gluten-Free Krispie Kreme Donut Holes Copycat Recipe. Love it, because, my lovelies, it's for real and it's that good. Start the day before you want to have these awesome donuts. Stir the water and yeast together in a medium bowl and set aside for 10 minutes. Whisk in a cup of the flour (ish) until it's smooth. Cover the bowl with plastic wrap and a kitchen towel, then leave in a warm place for 45 minutes to rise or until it gets bubbly (which is hard to see through the towel, but check on it at like the 30 minute mark, then again every 5-ish minutes or so). Combine the coconut oil and sugar in your stand mixer until thoroughly combined. Place the aquafaba in the coconut oil and sugar mixture and mix well. Add in the vanilla and salt. Mix well, too. Heh. Now, you're going to want to swap your whisk for the paddle on your stand mixer. Add the yeast mixture to the sugar mixture along with the rest of the flour, while your stand mixer is running. Allow to run until the flour is fully mixed in and the dough pulls away from the sides of the bowl. Place the dough in a large greased bowl covering with plastic wrap and a towel again. Let it rise in a warm place for approximately 1 hour (you can do 2, but there's not going to be much difference, honestly). Remove the dough from the bowl and place in a zippered baggie, forcing all the air out before closing. Break off pieces of the dough, rolling them into ½-inch thick balls. Cover with a damp paper towel and allow the donut holes to rest for 30-45 mins. Heat the frying oil to a point where a tiny bit of dough placed in the center of the pan causes it to bubble and fry nicely.. Carefully fry the doughnut holes on each side for 90 seconds. Place in a bowl over a paper towel to drain until all of the donut holes are cooked. Make the glaze by putting all the ingredients together in a small bowl and whisking together until the mixture is smooth. Dip each donut hole in the glaze and place on a wire rack to allow the glaze to harden. Be careful as you stuff them in your face, because you might stuff too many and then you have to do a trip to the hospital...it's just a thing. Get the recipe that inspired it all at: DinnerThenDessert! 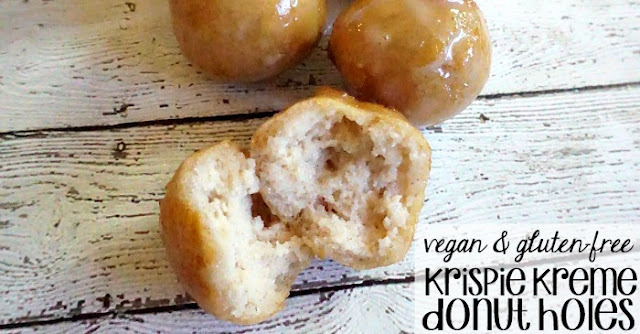 0 Response to "VEGAN & GLUTEN-FREE KRISPIE KREME DONUT HOLES COPYCAT RECIPE"